For more election research, check out "Can Americans trust elections?" Do you vote at a school or place of worship in your neighborhood on Election Day? Look around — 2018 may be the last year you do. Neighborhood polling places could become a thing of the past in San Diego in 2020, as more counties in California choose to conduct elections on the model of the California Voter’s Choice Act. Passed in 2016 and intended to both save money and improve voting flexibility, the California Voter’s Choice Act changes how, where and when Californians vote. The question on researchers’ and policymakers’ minds: Will the changes make for the largest and most diverse electorate yet, or will they have the opposite effect? Thad Kousser, UC San Diego Department of Political Science professor and chair, in Studio Ten300, discussing voter registration and local election trends. UC San Diego political scientist Thad Kousser is leading a team of researchers from five UC campuses to find out. Here’s how the Voter’s Choice Act works: In counties that choose to adopt the act’s model, all voters are mailed a ballot 28 days before Election Day. Voters can then return their ballot by mail, drop it off at a county ballot drop box or visit a vote center in their county. Vote centers will replace neighborhood polling places. They will give voters access to language assistance and, among other changes, enable them to register and vote the same day. Vote centers also expand early in-person voting, beginning 10 days before a primary or general election. The act requires one vote center for every 50,000 registered voters, starting 10 days before and up through the Friday before Election Day. On Election Day and the Saturday, Sunday and Monday leading up to Election Day, one vote center is required for every 10,000 registered voters. Of the state’s 58 counties, 14 were eligible to implement the changes in 2018 and five chose to do so: Madera, Napa, Nevada, Sacramento and San Mateo. Beginning in 2020, all of California’s other counties become eligible to adopt the act. That means 2018 is the ideal cycle to begin assessing effects, Kousser said—comparing vote tallies in counties that have switched to the new model to their own earlier records, as well as comparing to counties that are continuing with the status quo. California is transforming the way we register and vote in other ways also, Kousser said. And the UC research team he’s heading up will also be looking closely at that impacts of a state mandate to hold local, municipal elections at the same time as statewide and national elections (if turnout has proven below average). Municipal elections that are “off-cycle,” or not on the same schedule, are notorious for low turnout, earlier research, including by UC San Diego’s Zoltan Hajnal, has shown. Members of the UC research team — political science faculty and students from San Diego, Merced, Riverside, Berkeley and Davis — are not only looking at the voting data in the 2018 primary and general elections, they’re also conducting online surveys with 10,000 voters statewide. The surveys seek to compare voter experiences with the new and status-quo styles of voting. In counties that have made the switch, Kousser said, the researchers will also be asking: What might improve the experience? And would voters be willing, for example, to pay a $1 tax to have more vote centers or have them stay open longer? 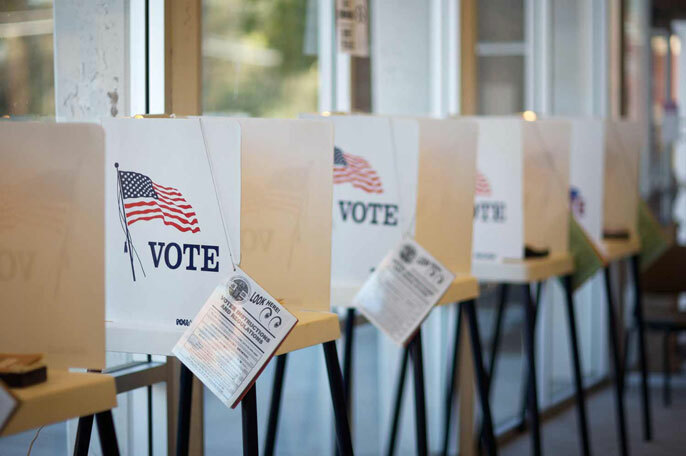 In 2019 and 2020, the researchers will also be running non-partisan randomized experiments to see what methods and messages motivate voters to get out and vote. One of the innovations of the research, Kousser said, is that the project, funded by a grant from the University of California Multicampus Research and Programs Initiatives, is leveraging UC’s presence in state government through the UC Center Sacramento and working directly with policymakers, including the office of the Secretary of State. What really motivates people to vote?